If you sailed near Block Island this August, you likely noticed the start of something transformative; something that was, until now, entirely foreign to U.S. waters. On July 26, 2015 Providence, RI-based developer Deepwater Wind made history by breaking ground on the nation’s first offshore wind power project, three miles to the southeast of Block Island. As sponsors of this year’s Block Island Race Week, Deepwater Wind spread the word to participating sailors that the highly anticipated Block Island Wind Farm will be up and running next time the event commences. The project will consist of five offshore wind turbines and will produce enough local, clean energy to reliably power 17,000 homes. By the fall of this year, the foundations for all five turbines will be in place and ready for the turbine and transmission line installation next summer. Block Island’s five state-of-the-art offshore wind turbines will finally display the accessibility of America’s largest untapped clean energy opportunity – at a time when new energy opportunities are exactly what the Northeast U.S. needs to identify and strategically select. With several coal-fired power plants recently retired or on track for retirement in New England, energy planners face decisions that will largely determine the region’s energy trajectory for decades to come. Construction of the Block Island Wind Farm will ensure that offshore wind power holds a place in such pivotal conversations. The Block Island Wind Farm is a pilot project, equipped to generate 30 megawatts of power. By comparison, the European Wind Energy Association released mid-year data in July announcing more than 10,000 megawatts of offshore wind power generation currently online across 11 countries in Europe. The National Renewable Energy Laboratory estimates that currently accessible Atlantic offshore wind hosts an abundance of power equivalent to that generated by 200 average coal-fired power plants. The inexhaustible, pollution-free resource far off the Atlantic Coast is poised to play an enduring role in America’s next energy chapter, and that chapter is starting in the Northeast. With strong public support and bold political leadership, this one small project will be a catalyst for something much larger – so as Northeast sailors, we ought to learn about what’s on deck! 1. 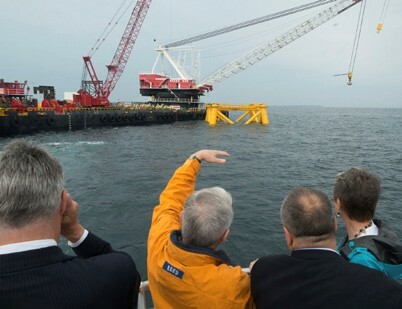 After the Block Island Wind Farm is built, no future U.S. offshore wind development will likely be visible from shore. (From the southeast bluff of Block Island, the turbines will only appear to be the height of your thumb on the horizon.) This is because the better wind is further offshore and – one of the benefits of getting in the game two decades late – turbine size and efficiency has advanced dramatically since the first wind farm was built. 2. The supply of offshore wind energy matches our demand. America’s coastal cities host dense populations and strained energy markets – with very few local, utility-scale sources of energy. Consider this: the wind far off the Atlantic Coast of Long Island is some of the best in the world for offshore wind power development, capable of providing energy for millions of homes and businesses. And not only is offshore wind power where we need it, it’s also producing the most power when we need it: during summer afternoons and winter cold snaps. 3. Offshore wind power can be developed in a manner that protects wildlife and their habitats throughout every stage of siting, construction, and operation – for that, the environmental community is united in support for offshore wind power. Properly locating turbines combined with best management practices minimize or prevent impacts on birds, bats, sea turtles, and marine mammals – and all species benefit from cleaner air and water and cutting the carbon pollution that causes climate change and ocean acidification. As a Northeast sailor, I can hardly imagine a greater testament to our region than to make carefully sited offshore wind power a pillar of a truly clean energy future. We have growing and urgent energy challenges to meet. Let’s raise the bar. We can pioneer a solution that celebrates the unique potential of the very resource Northeast sailors have been harnessing for generations. Let’s put our breeze on the map with a nod to tradition and a commitment to ensuring many more decades of breathing clean air while sailing on clean water. The National Wildlife Federation strongly supports offshore wind power that employs the highest standards of wildlife protections through all stages of development, and we have long been proud to endorse the Block Island Wind Farm. To get involved, reach out directly to me at hewetta@nwf.org, and learn more at NWF.org/OffshoreWind. Amber Hewett is the National Wildlife Federation’s Northeast Regional Campaign Coordinator. She lives in Newburyport, MA.